Installation. 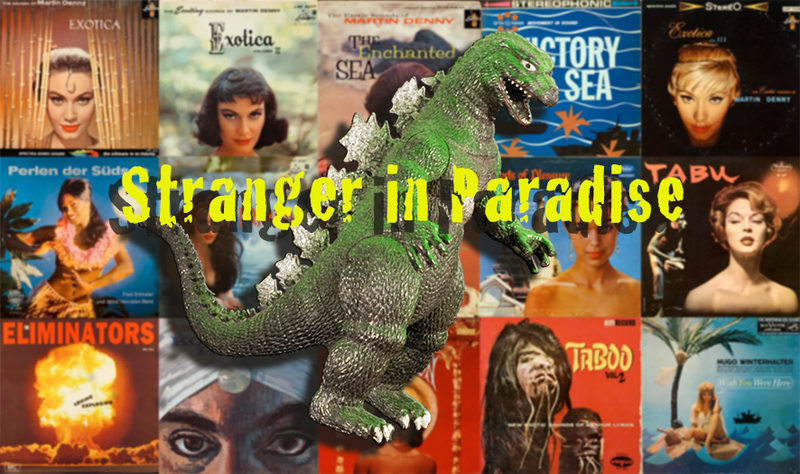 287 Record Covers: Exotica, Pacific, Hawaii, Nuclear Power, Godzilla. A floor made of vinyl records. Small table. Lamp. Garden stools. Two Godzillas. Commissioned by the Kallmann-Museum Ismaning 2014, for the group exhibition "Elswhere - Sehnsuchtsbilder in der modernen Kunst (Depicting Longing in Contemporary Art)"
"Stranger in Paradise" tells the story of the various transformations of the Pacific Ocean and its islands in the second half of the 20th century. During the 2nd World War this area was one of the bloodiest wargrounds. In the late 1940ies and 50ies the Musical and Film "South Pacific" initiated the "exotica" wave of the 1950ies and 60ies. At the same time it became one of the main testing areas for American nuclear weaponry, like the disastrous "Castle Bravo" test in 1954, only to be reinvented again as the tourist‘s paradise right after. The installation reflects these transformations through glimpses at popular culture artefacts as well as highlighting reflections and reactions. Speeches and lectures given by philosopher Martin Heidegger "On the Era of Nuclear Power" of 1955, or Linus Pauling "On Fallout and Nuclear Warfare" 1960, records issued by the USA Government ("If the bomb falls", 1959) and military ("U.S. Air Force Firepower", 1962, "Your Navy Presents Music On Deck", 1950ies) and other political statements are juxtaposed to a collection of exotica record covers, especially ones that transport the ideal of the "Noble Savage" and the secret powers of nature ("Tabu"). The Godzilla myth, that emerged directly from the Nuclear bombing tests is represented here as well. The exhibition was accompanied by the lecture "Castle Bravo, Heidegger, Godzilla and All the Rest", outlining in detail the historical developments and its implications for today. Issued on occasion of the exhibition: 82 x Sehnsucht (Longing & Desire). 82 samples of the word "Sehnsucht" as interpreted by singers and groups of all times and genres, from Schlager to Death Metal. Handmade 10" vinyl record. One-sided, artists edition of 45, signed and numbered, € 99.